PT Astra International Tbk (Astra) is one of the largest diversified conglomerates in Indonesia. This investment holding company is often regarded as the barometer of the Indonesian economy due to its presence in various sectors (automotive, agribusiness, heavy equipment, mining, energy, financial services, information technology, and infrastructure & logistics). Astra has shown strong and sustained growth after Indonesia was hit by the Asian Financial Crisis in the late 1990s. This severe crisis forced the company to restructure and reorganize its business model (including a takeover by the Hong Kong based Jardine Matheson Group in 1999 through its subsidiary Jardine Cycle & Carriage Ltd). The company has won numerous corporate awards - both national and international - in recent years and has set the ambitious goal of establishing its brand name globally as the pride of Indonesia by 2020. As of 2015, Astra International employs more than 225,580 people in 183 companies (including subsidiaries, associates and jointly-controlled entities). Starting as a small trading business founded by the brothers William Soerjadjaya and Tjia Kian Tie, PT Astra International Tbk has developed into an impressive conglomerate that operates predominantly in Indonesia and forms the largest listed company on the Indonesia Stock Exchange (IDX) with a total market capitalization of more than seven percent. The company is Southeast Asia's largest automotive group and provides a full range of automobile and motorcycle products, although in recent years it has lessened its traditional dependency on the automotive industry by expanding into other sectors to grow other revenue streams. In the automotive industry, Astra International's core business, the company holds a domestic market share of between 50 and 60 percent. Through a jointly-controlled entity with the Toyota Motor Corporation, Astra holds the exclusive right to sell Toyota vehicles on the Indonesian market. This Toyota brand is the dominant leader in Indonesia's wholesale car market. Astra also partners with Daihatsu, Isuzu, Nissan Diesel, Peugeot, BMW automobiles, and Honda motorcycles. In addition to the production and distribution of its automobile lines, Astra offers consultation services for the purchases of new cars, as well as insurance and financing services to support its automotive, motorcycle and heavy equipment sales. For mining, plantation, construction and forestry it delivers heavy equipment, related parts and after sales services. 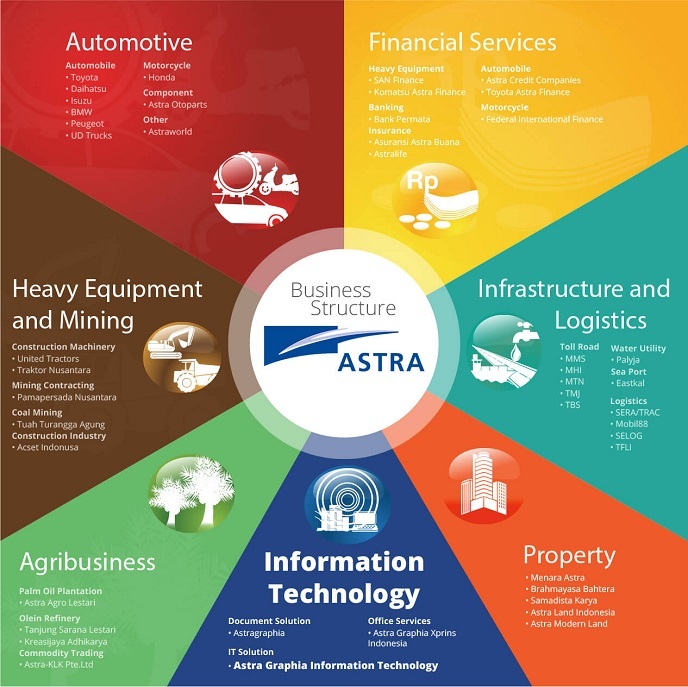 Other sectors that Astra has started to tap (through its subsidiaries) are coal mining, agribusiness (palm oil), information technology, infrastructure (toll roads, water supply in Jakarta and an oil tanking terminal in Gresik), as well as IT solutions services. Astra International is likely to retain its position as a top Indonesian company in the foreseeable future. With its expanding diversified businesses, the company is present in almost every major sector of the Indonesian economy and thus not so much dependent on the volatility of one specific sector as most other Indonesian companies. The automotive business is still Astra's core business although it has drastically lessened its traditional dependency on car sales. In the early 2000s, around 80 percent of Astra's revenue came from the automotive business but currently this number has declined to 50 percent. A deliberate change of course as prospects of the car industry are increasingly frustrated by government policy. The government is trying to curb huge subsidies on fuel, raised taxes for the possession of more than one car and has curbed excessive lending for vehicle purchases (by stipulating a higher downward payment for car purchases). This can cause profits from the automotive industry to become less robust in the future. On the other hand, Indonesia's current low car per capita ratio in combination with expanding purchasing power keeps car sales on track. In 2013, car sales hit a record high of over 1.2 million sold vehicles. The Astra Group is financially sound and has a strong presence in various markets. As such, the company is well positioned to benefit from Indonesia’s economic growth, natural resources and infrastructure development. The outlook for 2014 remains positive, despite heightened competition in the car market and weak coal prices, while concerns about possible increases in interest rates as well as rupiah volatility remain.